For dry, delicate children's hair. Helps nourish and strengthen hair. Makes it easy to detangle and work out knots. 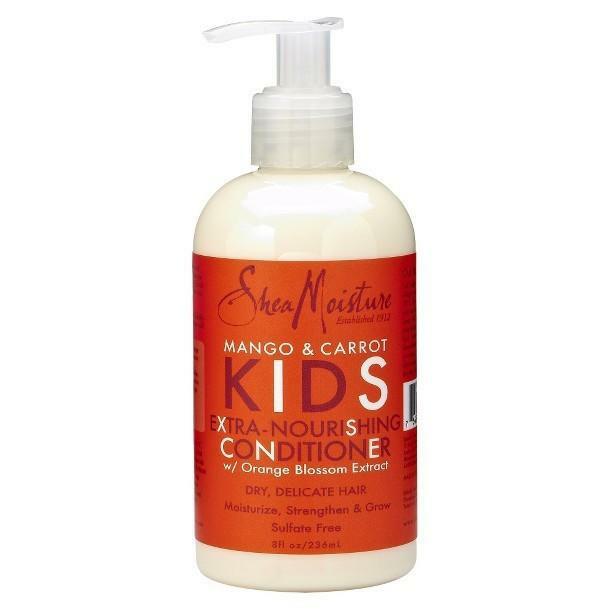 SheaMoisture’s Mango & Carrot Kids Extra-Nourishing Conditioner softens and smoothes children's hair, making it easy to detangle and work out knots. Helps nourish and strengthen hair while protecting against breakage. • Mango Butter is a moisture-rich emollient that leaves hair feeling silky smooth. • Carrot Oil nourishes hair, helping to prevent breakage and promote growth. • Orange Blossom soothes sensitive scalps. DIRECTIONS: Apply to clean hair. Leave on for some minutes. Rinse out.